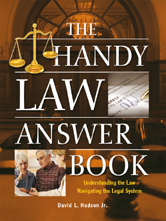 Editor/Author Hudson Jr., David L.
Combining practical legal tips with an exhaustive overview of the law in the United States, this comprehensive reference answers more than 1,200 questions ranging from "Where did the word tort come from?" and "How are state court judges selected?" to "Where did the first U.S. Supreme Court meet?" Useful advice includes how to find a lawyer; how to file a complaint against a lawyer; how to document discrimination in the workplace; and how to handle oneself in court.